Global Hemp Cord – Use for jewelry, beading, macramé, gardening, scrapbooking, hang tags, packaging and more. Hemp Cord is made from the longest, strongest natural fiber known: 100% industrial hemp. Hemp is the world’s oldest natural fiber dating back as far as 8000 BC. Our hemp is grown organically without the use of pesticides, herbicides, or chemical fertilizer. Hemp is not only strong, but is naturally resistant to UV (ultra-violet) light, mold and mildew. Short strand fibers such as cotton can break down and rot, thus hemp offers superior durability. Our hemp cord is completely biodegradable thus making it a superior alternative to synthetic products such as nylon. You can’t improve on the best. That’s why Global Hemp Cord is the preferred choice for all hobby, business and household uses. Our polished hemp cord is available in six weights and a wide assortment of colors. Hemp cord performs very well for making jewelry, beading and macramé because it makes attractive and firm knots. The most popular size for making jewelry is 20# size (1mm diameter) and is available in 20 colors. Unlike many other fibers, hemp is round by nature, so as a cord it is easy to work with and does not cut plants or the hands tending them. Its also fully biodegradable and naturally weather resistant. Use 48—170# (1.5—3mm diameter) size for tying and binding vines or tomato plants, staking trees, etc. Use as an attractive accent to a variety of decorative projects. Add flair to your products. Commonly used for clothing, gift tags, baked goods, Christmas tree ornaments, etc. An excellent choice for tying, binding, securing or wrapping a wide variety of products such as natural, environmentally friendly, vintage, shabby chic, or homemade. Hemp cord is made from the bast fiber (outer bark) of the hemp plant. Bast fibers are first processed into yarn by twisting together groups of individual fibers into plies. Then, these single plies of yarn are twisted together in the opposite direction to make a thicker and stronger yarn. Various plies of yarn are twisted to form an individual stand. One or more strands are twisted together to form a specific size. Finally, its polished with either paraffin wax, beeswax or vegetable starch (wheat, corn, or potato) to protect the underlying fibers. For example, 20# test strength (1mm diameter) size hemp cord are made of 3 strands of 4-ply yarn. You can see and feel the difference. 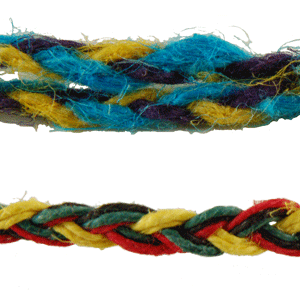 Hemp twine (top) is made with single-ply yarn versus Global Hemp Cord (bottom) which is made with multi-ply yarn. Global Hemp Cord is stronger at a smaller diameter. For example, Global Hemp 20# test strength size is 1mm in diameter, whereas competitors 20# test strength twine is thicker — 1.5mm in diameter — to achieve the same strength. Not only does the use of multi-ply yarn create a stronger product, it makes for a much finer and smoother product. Thus, Global Hemp Cord is virtually free of kinks and is not frizzy. Due to the fact that Global Hemp Cord has a smooth finish to begin with, its not necessary to cover it in a thick layer of wax during the polishing process. Competitors apply a heavy layer of petrochemical based paraffin wax to cover-up the underlying imperfections in their product. It can be a bit confusing to purchase hemp cord as the traditional method of gauging the product is by its test strength. For example, the most popular size for creating hemp jewelry is 20# (the “#” refers to pounds). These indicates that the cord has the test strength of holding 20 pounds (9 kilograms) before it will weaken and eventually break. Therefore, for staking tomatoes, one would want to use a stronger hemp cord such 170# size as it will not only hold up heavy tomatoes, but will support the plant during storms with severe wind. A better indicator of size for modern use is the diameter (cross section or width), rather than its strength. This is due to the use of hemp cord for crafting projects such as scrapbooks. Someone who wants to apply hemp cord to a scrapbook project is not interested in the test strength of hemp cord, rather they want to know its diameter to determine what size will look best with their layout. Global Hemp Cord varies in size from .5 mm to 3 mm (millimeters). The most popular size for producing hemp jewelry is 1 mm (20# test strength). Vegetable starch, beeswax, or paraffin wax are applied to preserve and protect the underlying strands of yarn which aids in withstanding stresses involved in working the cord into knots or stringing beads. Global Hemp Cord uses environmentally friendly vegetable starch from either corn or potatoes as a polish. Most competitors use paraffin wax which is a petrochemical. Beeswax can also be used to polish hemp cord. Global Hemp uses environmentally friendly fiber reactive dyes as do most competitors. 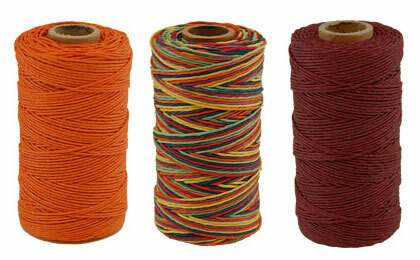 However, Global Hemp Cord colors are more vibrant than competitors. Global Hemp also color matches its colors to achieve consistency between dye lots which ensures the red hemp cord you purchase today will be the same when you make your next purchase.